There are many plants that are ideal for a rain garden. Whether your garden spot is sunny or in the shade, you can find plenty of plant varieties to create a stunning addition to your home landscape. You can fill a sunny rain garden with dynamic plants and flowers of varying heights to give this garden spot diverse color and depth of design. 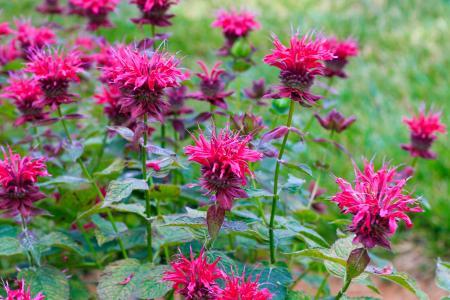 Bee balm (Monarda) is an adaptable perennial that can drink lots of water but can also survive just fine in drought-like conditions. 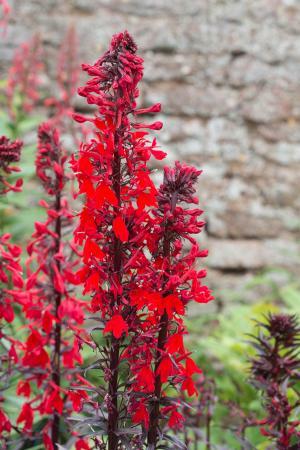 This makes it a highly prized choice for unpredictable summer weather regions. Give it all the sun you can for a highly prolific flowering. Choose from a pink, red or purple blossoming plant. Growing challenges: This plant is prone to powdery mildew. A perennial wetlands wildflower, the cardinal flower (Lobelia cardinalis) is considered an outstanding choice for a sunny pond or bog area. In less wet terrains, it fairs best with partial afternoon shade. The brilliant red tubular flower makes a good naturalizing addition to any rain garden. Growing challenges: There are no real challenges to growing this plant. Cut back at least 50 percent of the blooms to encourage a second blooming in the fall. The perennial New England aster (Symphyotrichum novae-angliae) features purple dome mounding flowers. The blooms are larger than other aster species. This flower is typically planted in full sun but can survive in partial shade. 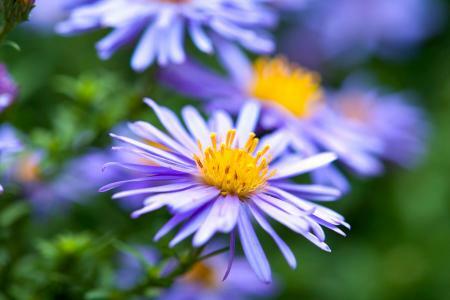 Unlike some versatile rain garden plants, this aster species prefers moist soil. Growing challenges: The New England aster can be aggressive if unchecked. It's susceptible to powdery mildew and doesn't tolerate hot dry weather. Swamp milkweed (Asclepias incarnata) is one of the popular milkweed species that attracts Monarch butterflies. 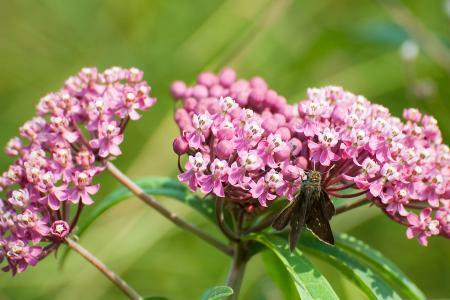 This perennial is also known as pink milkweed with large bloom clusters. As its name suggests, this variety needs moist soil. It can survive in partial shade but prefers full sun. Growing challenges: Aphids love milkweed and can become a pest problem. Blue-eyed grass (Sisyrinchium angustifolium) may be called a grass and even look like a grass, but it is actually of the iris family. 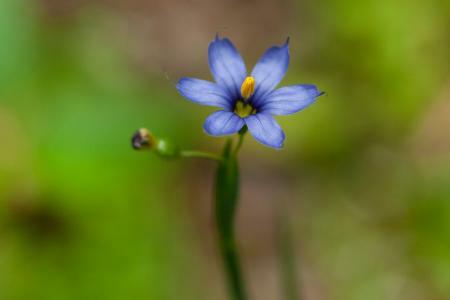 The blue, six-petal, star-shaped flowers feature a yellow eye and are sun lovers. This plant is self-seeding, but you'll want to divide it at least every three years. Growing challenges: Self-seeding occurs best in good fertile soil. There are several rain garden plants suitable for a garden located underneath a tree canopy or other shaded area. 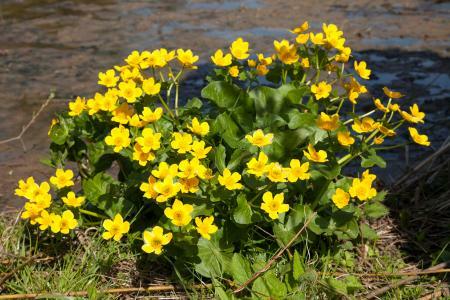 A perennial succulent, marsh marigold (Caltha palustris) is aptly named since it loves wetland environments. The leaves are broad and kidney-shaped. The blooms are a misnomer since the yellow clusters resemble buttercups instead of marigolds. Growing challenges: The plant juices can blister or inflame when they come in contact with the skin. The leaves are toxic if ingested raw, but they can be eaten when boiled. 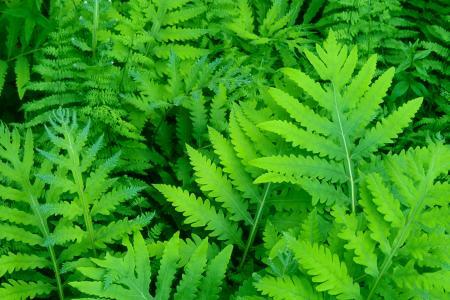 Sensitive fern (Onoclea sensibilis) is a good heavy shade to partial shade naturalizing perennial plant. This native marsh and swamp plant is adaptable to nutrient rich, well-drained rain gardens. The wetter the garden location, the taller the plant will grow. Growing challenges: This plant spreads by spores and rhizomes that can make it aggressive when the perfect growing conditions exist, such as wetlands. Swamp azalea (Rhododendron viscosum) provides beautiful white or pink blooms. This native swamp plant has a high tolerance for poorly drained soil and wet soils. It also has a high tolerance for land that occasionally floods, but the plant won't survive directly in water. The swamp azalea prefers the partial shade provided by dappled light from a canopy of trees. 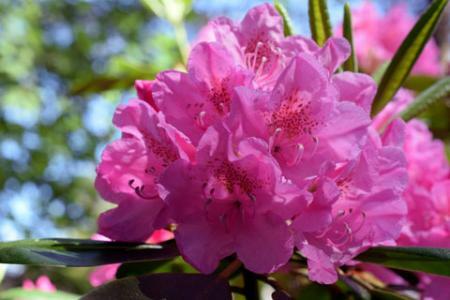 Growing challenges: Never plant a swamp azalea near a butternut or black walnut tree since the roots of both trees produce juglone, a chemical that's toxic to the azalea. When you select plants for your rain garden, first determine if you need full sun, partial shade or full shade plants. 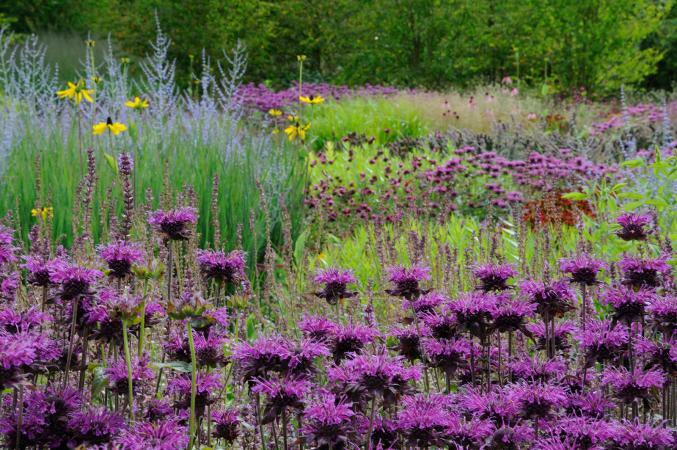 Choosing plants of different heights will make your rain garden appear more natural and interesting.